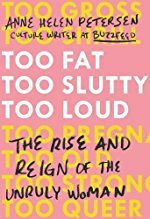 In Too Fat, Too Slutty, Too Loud, cultural critic Anne Helen Petersen has written her own catalog of unruly women: celebrities and other cultural figures who have been called too strong, too fat, too gross, too slutty, too old, too pregnant, too shrill, too queer, too loud and too naked for uncomplicated cultural acceptance. She ranges from Serena Williams (too strong) to Lena Dunham (too naked) and shows how each woman defies norms while still staying close enough to the edges of respectability to achieve mainstream success. I haven't read this yet but Anne Helen Petersen's interview with Sam Sanders on the "It's Been a Minute" podcast convinced me to put it on my reading list (as has basically everything else Petersen has ever done). That is what lead me to buy it! Super recommend reading it. I haven't read the book, but damn if Hillary wasn't considered "too well prepared", like you can be overqualified for the lowly job of President of the US of A. Yes! I loved that interview too, and it's the only episode of the podcast I've listened to. But I loved how thoughtful she was in that interview. It was a great conversation about intersectionality. I've read most of the book. Some chapters are a lot better than others, and it seems clear to me who she is really interested in talking about (Serena Williams, the Broad City ladies, Lena Dunham) and who she isn't (the Nikki Minaj and Melissa McCarthy chapters were surprisingly boring). The Jennifer Weiner chapter may actually have been the most interesting one, but it's barely about Jennifer Weiner - it's more about the literary world and the individual it spends the most time on is actually Jonathan Franzen. Which I found mildly annoying in a book about women, but overall, it was a fascinating chapter that taught me something I didn't know, and it's clear she's really interested in and thoughtful about that topic. I will, as always, read anything that she writes, because I love her voice and I think what she's doing - pop culture/gossip analysis from a critical theory perspective but written for a popular audience - is really cool. But I also want Elaine from Lainey Gossip to write a book too! Elaine must have a fantastic book inside her! Elaine Lui has written an autobiography Listen to the Squawking Chicken: When Mother Knows Best, What's A Daughter to Do? A Memoir (Sort Of). Oooooh, thank you! I should have done a google.